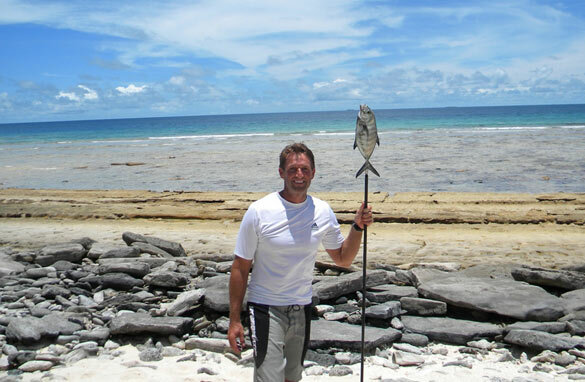 WASHINGTON (CNN) - This past summer, Rep. Jeff Flake went into the wild. After two years of planning, the Arizona Republican spent a week on a remote, uninhabited island in the middle of the Pacific Ocean, eating coconuts and fish he caught with a spear, purifying his own water, sleeping in a hammock on the beach, and writing daily in his journal. He listed a number of reasons for going on this trip, calling them "more physical than spiritual." And while he didn't end up talking to a volleyball, like Tom Hanks did in "Cast Away," he did find some unlikely friends - a few hermit crabs. "I picked up a hermit crab, and, spotting the sharpie, wrote the number '1' on the back of his shell, and put a circle around it. I repeated this act whenever I felt a bit lonely," Flake wrote. Later, he added, "I've labeled 102 at this point with a sharpie marker. I just saw number one again today. He's remains one of my favorites, as is number 12, long since forgiven for pinching my toe." In the latest installment of CNN=Politics Daily: History was made at the Capitol on Tuesday as the Senate Finance Committee voted to move an $829 billion health reform bill to the floor of the Senate. Congressional Correspondent Brianna Keilar has the story. Meanwhile: In Russia, Secretary of State Hillary Clinton sat down with Foreign Minister Sergey Lavrov. Foreign Affairs Correspondent Jill Dougherty is in Moscow with details on how these diplomats dealt with the highest priority on the agenda - potential sanctions on Iran. Finally: In a special report, CNN Correspondent Jessica Yellin delves into the murky past of health care reform legislation and breaks down what has to happen in both houses of Congress for pending health care bills to make it to President Obama's desk. WASHINGTON (CNN) - President Barack Obama expressed satisfaction Tuesday with the Senate Finance Committee's passage of a health care bill, but said more work remains. "We are now closer than ever before to passing health reform, but we're not there yet," he told reporters in the Rose Garden. "Now's not the time to pat ourselves on the back." Instead, he said, it is time to "dig in and work even harder to get this done." WASHINGTON (CNN) - President Obama and Vice President Biden both called Senate Finance Committee Chairman Max Baucus to congratulate him on committee passage of a health care bill, according to Finance Committee spokesman Scott Mulhauser. 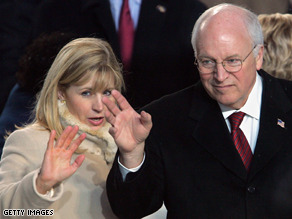 Liz Cheney and her father have been among the most forceful conservative critics of President Obama's foreign policy. (CNN) - Months after her father's prolonged campaign against President Obama's national security policies, Liz Cheney is spearheading a new organization aimed at organizing conservative opposition to the new administration's foreign policy approach. The new group, Keep America Safe, says its aim is to provide a cogent and organized rebuttal to a series of recent moves that expressly divert from the more muscular policies of the Bush administration. The group plans to tackle hot-button issues like the way forward in Iraq and Afghanistan, defense spending, CIA interrogation techniques and the planned closing of the Guantanamo Bay detention facility. "We have watched with concern and dismay as the Obama administration has cut defense spending, wavered on the war in Afghanistan, and launched investigations into Americans serving on the front lines of the war on terror, while at the same time expanding legal protections for the terrorists that plot to attack this country," Cheney, along with the group's two other founders, wrote on its Web site. "These policies, along with President Obama's abandonment of America's allies and attempts to appease our adversaries are weakening the nation." Weekly Standard Editor William Kristol and Debra Burlingame, the sister of the pilot of American Airlines Flight 77 - the flight that crashed into the Pentagon on 9/11 - are also heading up the new effort. The new group says its goal is to focus media attention on continuing and emerging national security threats, and marshal grassroots opposition to the president's policies. The RNC relaunched GOP.com Tuesday. WASHINGTON (CNN) - The Republican National Committee debuted its newly redesigned online portal GOP.com Tuesday - but not without a few technical headaches, including some that left the site completely unavailable for parts of the day. “Due to a high volume of web traffic, our new website experienced a few technical difficulties, but we are working out the glitches to bring it back to full working order,” the RNC's Director of Media Affairs LeRoy Coleman said in an e-mail to CNN. 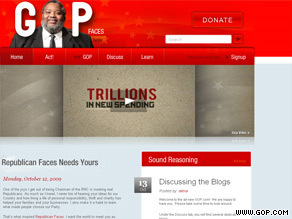 The new version of GOP.com, which prominently features images of women and ethnic and racial minorities, plugs the party's involvement in social networking sites. A section on the homepage allows users to see posts on the GOP's Facebook page, where roughly 93,000 people have connected with the RNC. From the new site, users can also view the RNC's Twitter feed along with YouTube videos and a flickr slideshow. The party says new site will also act as a Web platform that will play host to applications which the party is encouraging conservative online activists to build for the site. It also hosts eight new blogs, including a blog written by Steele, entitled "What up?" "The Internet has been around for awhile, now," Steele writes in his first blog post on the revamped site. "Today, I want to begin to better connect with Republicans everywhere." But not all Republicans are happy with the new approach, as the site faced some early criticism from conservatives. A blog post on the conservative portal townhall.com called GOP.com a "(Red) Hot Mess" and "downright embarrassing." 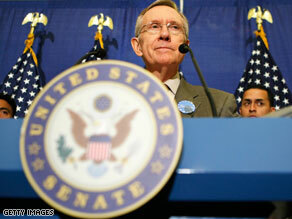 Senate Majority Leader Harry Reid is up for re-election in 2010. WASHINGTON (CNN) - Senate Majority Leader Harry Reid might be trailing two Republican challengers in polls surveying the 2010 landscape in Nevada, but he's also one of the better-funded candidates in the country. Reid's campaign announced a substantial third quarter fundraising haul on Tuesday, reporting more than $2 million raised over the last three months. Even more impressive: the Democrat has collected over $12 million for his campaign, and can boast of $8.73 million in the bank - all with more than a year to go until Election Day. The Reid camp is pledging to raise $25 million for his re-election bid, as polling indicates a tough road ahead for the Senate leader. Reid trails Nevada GOP chairwoman Sue Lowden, 49 percent to 39 percent, according to a Mason-Dixon poll commissioned by the Las Vegas Review-Journal and released Sunday. Reid is also losing by a 48-43 margin in a hypothetical race against another leading candidate for the Republican Senate nomination, businessman Danny Tarkanian. In more bad news for Reid: Nearly 100 percent of Nevada voters know who Reid is, and 50 percent of them hold an unfavorable view of the Democrat. Just 38 percent have a favorable opinion. WASHINGTON (CNN) - As the Senate Finance Committee passed its health care bill out of committee without a public option Tuesday, Speaker Nancy Pelosi stood on the other side of the Capitol insisting again that the House will pass a bill with a government-run insurance option. "I am for the public option. That will be the House position, and that will be the position we will go to the conference to fight for," Pelosi said. Pointing to a CBS poll from last week that found 62 percent of Americans favor a public option, Pelosi argued "the public is way ahead of elected officials in this." The Speaker said she's aiming to pass a bill by Thanksgiving, but acknowledged others are projecting Christmas, and concluded a bill would pass "certainly this year." 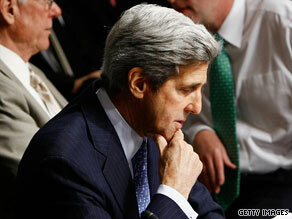 Sen. John Kerry, D-Massachusetts, is a member of the Senate Finance Committee. WASHINGTON (CNN) - They're angry and fighting back with full force. The White House, Democrats and health care experts are blasting a new insurance industry trade report that finds that health insurance premiums for the typical American family would increase by $4,000 by 2019 under a key Senate overhaul plan. The analysis by America's Health Insurance Plans indicates that under the Senate Finance Committee plan - spearheaded by Democratic Chairman Max Baucus - the costs of private health insurance would rise by 111 percent over the next decade. Under the current system, costs would rise by 79 percent, the report said, and premiums for individuals could rise by an extra $1,500 if the Baucus plan is implemented. The report was conducted by the firm PricewaterhouseCoopers. The committee passed the long-awaited $829 billion health care bill by a 14-9 vote Tuesday.